In rural Dalaston, a quiet wedding festival is ruined when a rampaging dragon descends from its mountain aerie to rain fire and destruction on the peaceful celebration. In desperation, the town's leader turns to a mysterious stranger who promises protection from the dragon - in exchange for a few sacrifices. Now the children of Dalaston rise from the dead as ghastly abominations to enforce martial law and kidnap people for their mysterious master... including the blushing bride herself. With time quickly slipping away, can the PCs break the undead curse on the town and stop the dragon from destroying what remains? 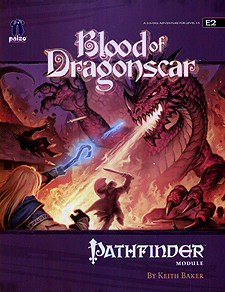 Blood of Dragonscar is a dragon-slaying city adventure for 15th-level characters, compatible with the 3.5 edition of the world's most popular roleplaying game. Within you'll find information on the mining and brewing town of Dalaston, new monsters, a draconic lair deep inside an active volcano, and the fire-breathing dragon itself. This adventure takes place in the decadent nation of Taldor in the Pathfinder Chronicles campaign setting, but can easily be adapted for any game world.